For-Minecraft.com » Minecraft PE 0.17.0 » Minecraft PE 1.0.4 - Villager trading! This is what we have been waiting in the Pocket Edition! 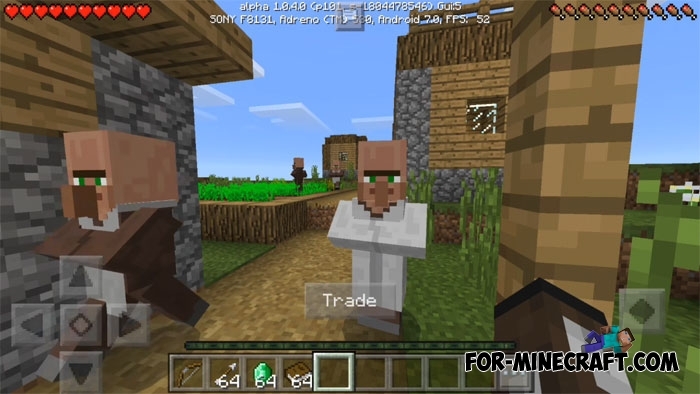 Finally, Villager trading in Minecraft PE 1.0.4! Now we can fully use the emeralds as a currency to buy items. How to trade in MCPE? Trading is no different from the PC version of Minecraft but if you do not know how to do this, then read below. All you need is an emerald that can be mined from the emerald ore. Emeralds are also found in some dungeon such as the desert or the jungle. Find a few emeralds and go to the villager. Every villager has a unique item for trading so you will need additional items. For example, you may need to fish and diamonds to get enchanted book. Tap on the Trade button and move items from your inventory into the trade box. The interface is very easy to use which simplifies this feature. After the exchange, you get a little experience and the villager will show sympathy toward you. There are different types of villagers: a fisherman, a butcher, a librarian and others. Therefore, I advise you to trade with all villagers. Trading works both single player and multiplayer modes. But that's not all, you can now install any addon for any version of Minecraft PE (0.16.0 or 0.17.0). They will work as before without problems. Go in the Mods category and choose absolutely any addon for MCPE if you want to change the game. Now you can change the model of Shulkers and Ender Dragons by using an addons. And of course, the developers have fixed many bugs and optimize performance.